I love candles, if you step foot in my room that would be easy to figure out as I tend to have at least 3 burning at the same time along with my electric wax melt. 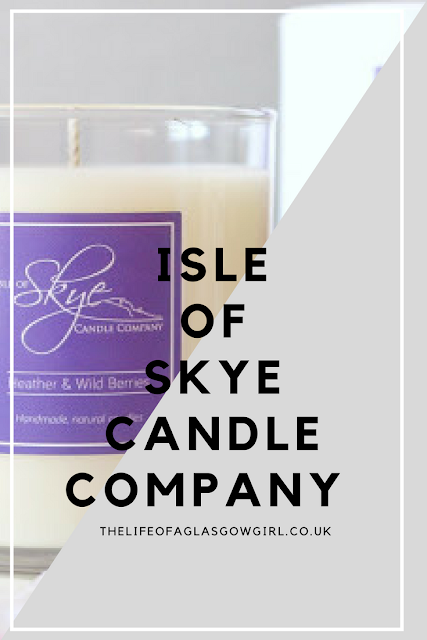 Candles for me really add that relaxing touch, I use them to de-stress, decorate, cheery up and more so when Isle of Skye Candle company got in touch I couldn't turn this opportunity down could I? Isle of Skye Candles have a huge range of high quality products on offer such as 3 wick candles, Diffuses, Tumbler candles and more. Their products are natural soy wax, hand poured in the isle of Skye, in the highlands of Scotland (I love me some Scottish products!) 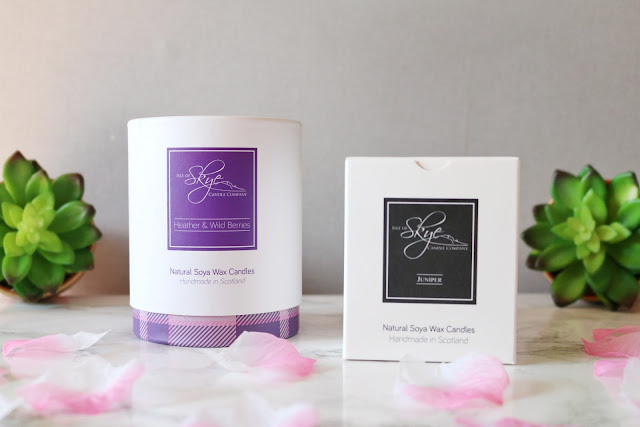 Each candle has a beautiful fragrance that carries some amazing benifits, I'm going to tell you about the ones I received but if you would like to to read more about their fragrances then click HERE. "After finishing a gap year in Canada, founder James starts working for a soap company based in the main village on Skye, Portree. 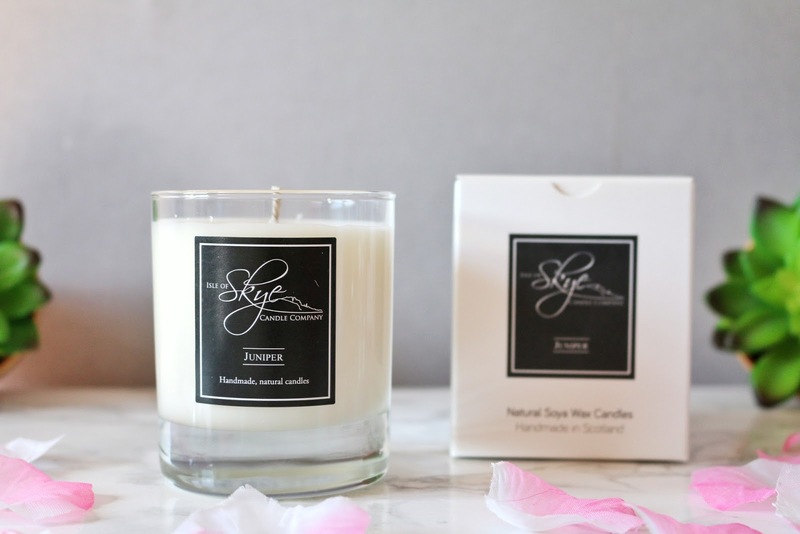 Discovering a flare for mixing scents and having a passion for natural products he sets about starting the Isle of Skye Candle Company to compliment the soaps... Read More"
First up is the Juniper small tumbler I received. This beautiful candle smells heavenly, I have never came across this scent before so this made a huge impact with me. The first time I started burning it I was blown away with how well the scent reach was! I could smell this when walking up the stairs which was amazing, I really couldn't believe that this little candle could fill the whole upstairs with such a beautiful scent. This candle burns for around 30 hours which is really impressive, I like candles that have long burn times, it really makes it worth the money because you're getting good use from them. The Juniper fragrance aids you in truly unwinding at home. It's subtle sweet wood aroma & properties to relieve exhaustion is bound to help you shake off the office blues. This scent really is the perfect aid in helping you relax, I know that it really did help me, I was in a whole world of calm vibes with this burning away. Now onto their Heather & wild berries large tumbler candle. I have to admit, this one is my absolute favourite! The scent is so heavenly that I melt into a world of my own just smelling this candle when it's not even lit! The size of this candle is impressive and this one burns for around 45 hours, meaning that I get to experience the scent over and over again for quite a long time! The first thing I noticed about this candle was the beautiful packaging, I am just in love with the "box" it comes in, I say box in quotation marks because it's not square. I love the purple tartan touch in this, it really does scream Scotland to me as I always associate tartan with anything Scottish. When this candle was burning I was praying that the scent would fill the upstairs of my house again but this time it didn't... it filled the whole house! How amazing is that?! I could smell this candle when I was in the living room, that's pretty impressive to say the least. The candle burns really well, sometimes candles tend to burn right in the middle and leave all this wax up the sides but this one burns rather even. As I mentioned, this scent was my favourite because it's very easy on the nose, In my opinion I think this would be a great candle to get someone as a present as it seems like a scent everyone would enjoy. You really can smell the berries through this and it's just an amazing scent experience. The Heather and wild berries fragrance is a subtle mix of flowering Scottish heather complimented by carefully selected sweet oils. The mix of blueberries, blackberries and raspberries give this fragrance a distinctly warm feeling. This candle is perfect for anyone who just wants to get lost in a haze of feel good scents, I really did enjoy burning this one and I will continue to do so. All in all I am impressed with these candles. The quality is fantastic, the scents last for ages and fill the house plus they are really good burners. I think anyone would be happy to own one of these or even a few! I would urge anyone who is a big candle lover to give these a try, you'll be hooked. Your photography is as gorgeous as ever, Jordanne! 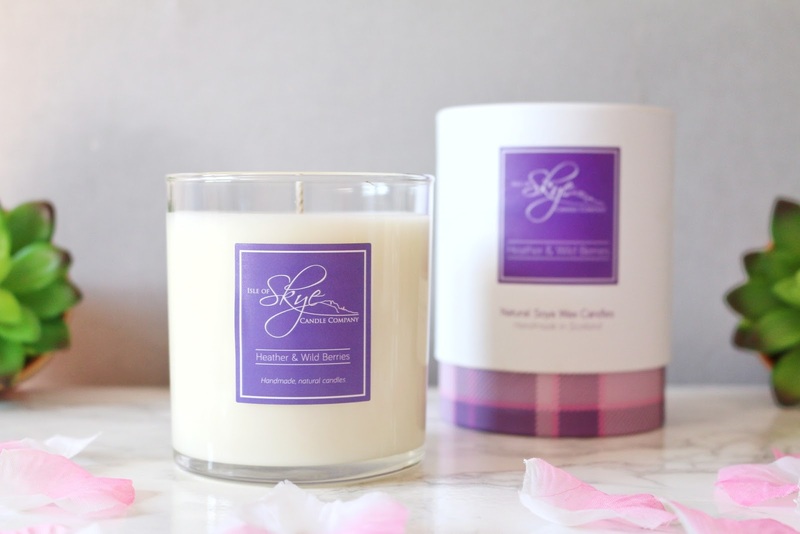 I am almost the complete opposite to you as I rarely burn candles, but I think I'd soon become an addict if I had a set of these beautiful Isle of Skye candles in my bedroom! The juniper fragrance sounds right up my street, anything that can infuse the whole upstairs of the house with a beautiful scent can only be a winner! Aww thank you so much Abbey! I love using candles, Always got to have one lit and making my room smell nice haha. These really are perfect! It's definitely my favourite from the two, it smells absolutely heavenly. Thank you hun! Can't go wrong with a good candle at all! They are absolutely phenomenal to say the least, I just love how well they burn and the reach of the scent. They look great. I don't use a lot of candle products as have it's of allergies but these have given me a fab idea for pressies for a couple of people for (whispers here as far too early to talk about) Christmas!!! Haha I already have Christmas all over my brain... they really would make an amazing gift! 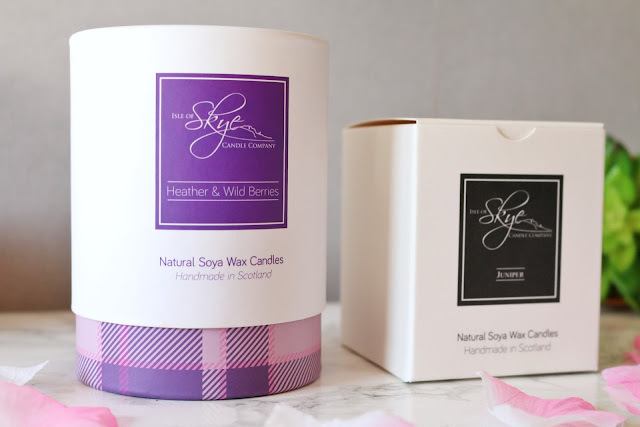 I really like the sound of the heather and wild berries scent - candles are my weakness! Heather and wildberries sounds lush! Love a good candle, too, especially when the nights draw in! OMGoodness Jordanne reading your description of these candles made me feel like I was smelling them to and I'm definitely going to look out for them, I'm not into candles unless they are really good ones so may have to treat myself! They are fab! definitely perfect for a treat as they are amazing quality. I love finding new candles and scents. I try to change mine with the season, I love richer ones for winter and light fruity ones for the summer. These candles look absolutely gorgeous! I've never really been a candle person but I did use a diffuser in my university room, which smelled incredible! I'll have to get another one! Oh I've always been a candle person! I just love the scent they give off, I've never actually used a diffuser but I might look into them! It's such a beautiful scent, don't get me wrong, the other one smells amazing as well!! They are such beautifully packaged! Love this. I am obsessed with candles! I love candles too. Burning a coconut candle as I type. They relax me. These candles look lovely. I am a major candle fan, my mother too and these look great and sound heavenly. Every time I walk past my local shop I always get dragged out by my fiancée, desperate to try the Heather & Wild Berries one!